Galaxy Note8: What is Air Command? 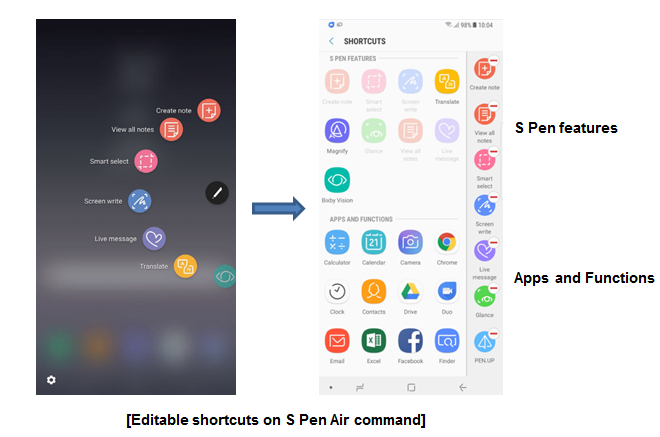 With the Air command panel, you can quickly launch useful S Pen features and frequently used apps. press the S Pen button. You can also tap the Air command icon with the S Pen. When the screen is off or locked with a screen lock method, removing the S Pen will not open the Air command panel. What is the Peel Smart Remote application? Why are there ads on my lock screen and how can I get rid of them? How to enable Call forwarding to next number in Samsung Galaxy J2-2016(SM-J210F)? Tweet us, 8am-5pm, 7 days a week. A new way to get the answers you want. Incredible technology with even more amazing support. The Samsung Interactive guide is the latest and greatest way to get the support you need, when you want. Find out more on how you can get face-to-face support. Samsung SMART SERVICE allows you to experience a whole range of services, right here at our Samsung Experience Store!